As seen in Highland Park over two years, one never knows what is to be discovered in Highland Park. 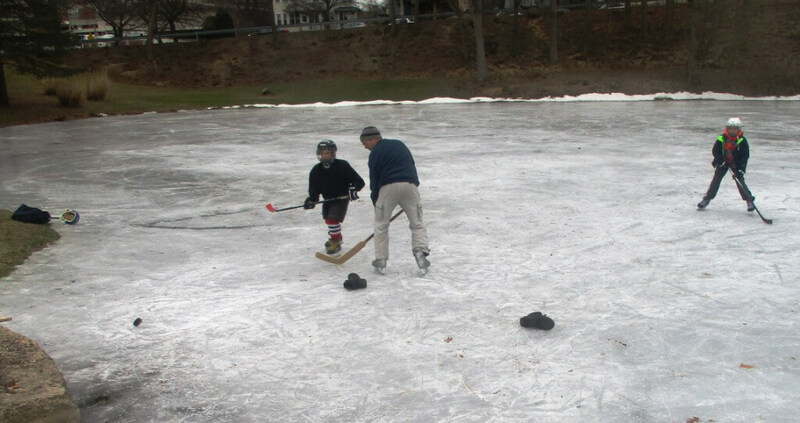 Last winter at dusk, en route to the Frederick Douglass Community Library on South Avenue, I noticed on Lily Pond eight or nine guys of various ages playing a spirited game of ice hockey: the ice thick, the cuts sharp, the clatter of sticks, shots made and missed at the goal nets set up on opposite ends of the pond. 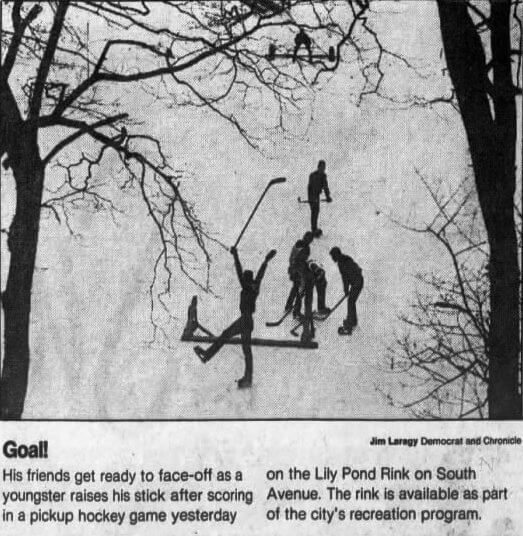 Looking down from the road at the bucolic scene, the game felt like a throwback to a different era or century when most hockey was played outdoors and open air. 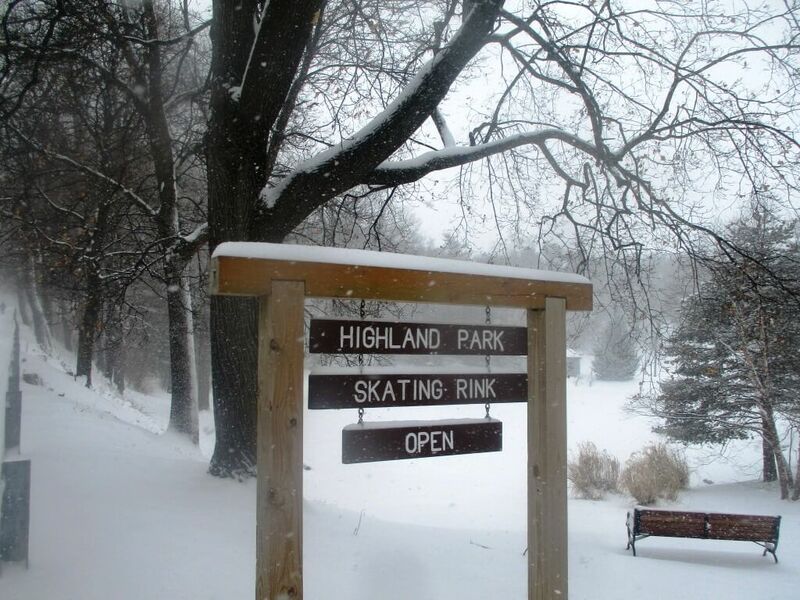 The action reminded me of boyhood: brilliant winter afternoons playing makeshift games on the pond in the woods near Westfall Road before the manicured Lac de Ville and Topp’s Plaza encroached. Unlike these diehards on Lily Pond, those boys of winter have long ago disappeared. Alas, I didn’t have a camera, costing dramatic shots of the roof lights on Highland Hospital and the car lights on South Avenue glimmering on this tucked away urban oasis. I learned from the guys that hockey players have been periodically gathering for years before the sun sets on weekdays and sometimes on weekends. According to the players, most people in the hockey world — and certainly in the Rochester world in general — don’t know of the spot so different from the indoor rinks The guys — who also play at other venues — said it’s often difficult to find enough bodies willing to make the trek and brave the cold and snow. That weekend, I came across three more players, a father, his son and the son’s friend. Using boots as goal posts, the three checked and shot while the moms watched. (The boys wore helmets but the father did not.) The man had vaguely heard about the big game but had never been, mentioning it was hard enough to find time on weekends to play. Last winter, I did not find the game a second time and am still looking this year — although no doubt at some point the players have made the trek and braved the cold. 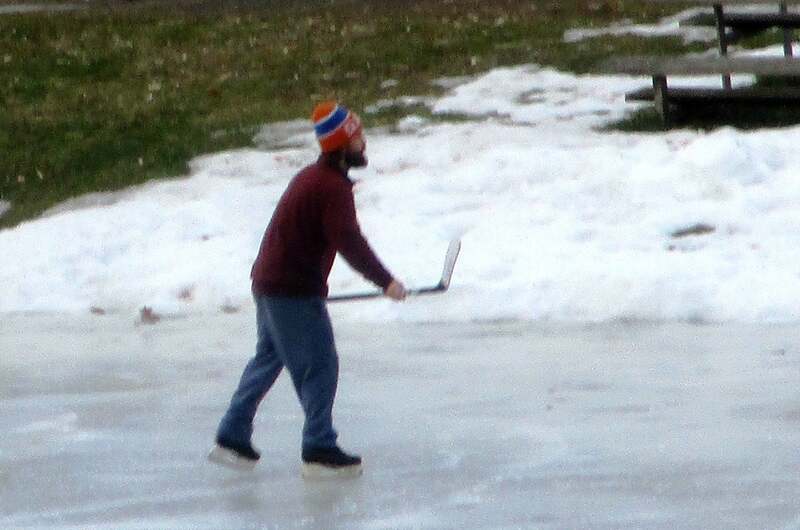 On Monday, I did find Brandon Young practicing his skating and stick handling solo on the pond. 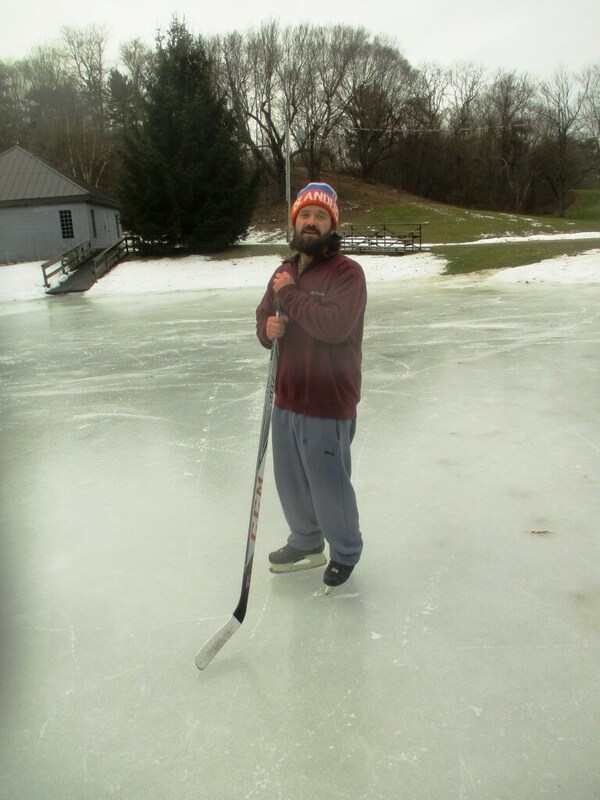 When not running his paver cleaning/repair business, Brandon drives the Zamboni at the Bill Grey’s Ice Plex in Brighton, a job he enjoys and also allows him to occasionally use its rink. Brandon had not heard of the game, but was intrigued. We imagined what it could be like if the full lights surrounding the pond were used, lighting up this urban hockey oasis. So I am still looking for the game. 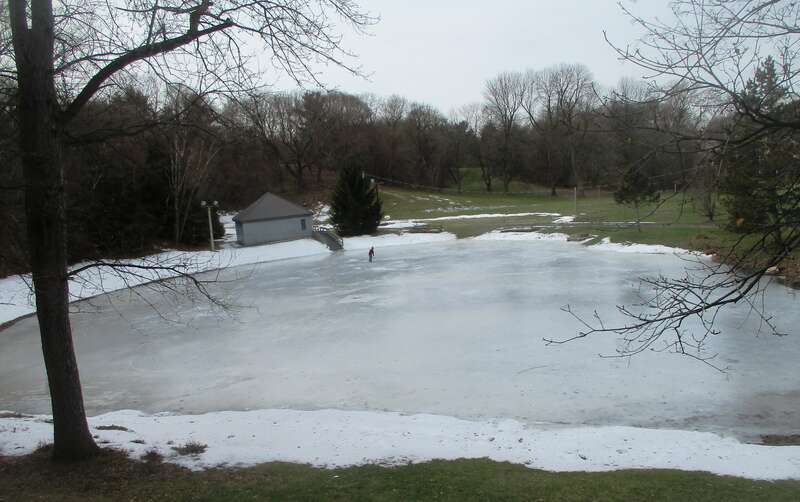 If you know anything about it, let us know: Dkramer3@naz.edu We probably only have a few weeks left of thick ice. Then soon enough another sport will find its way to the park. 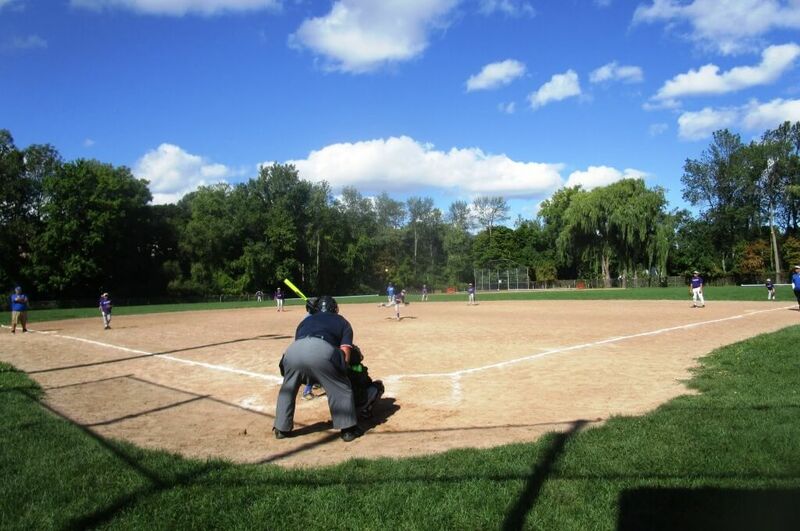 Next to Lily Pond, the Southside Little League plays. Chuck Healey calling balls and strikes, 9/24/16. 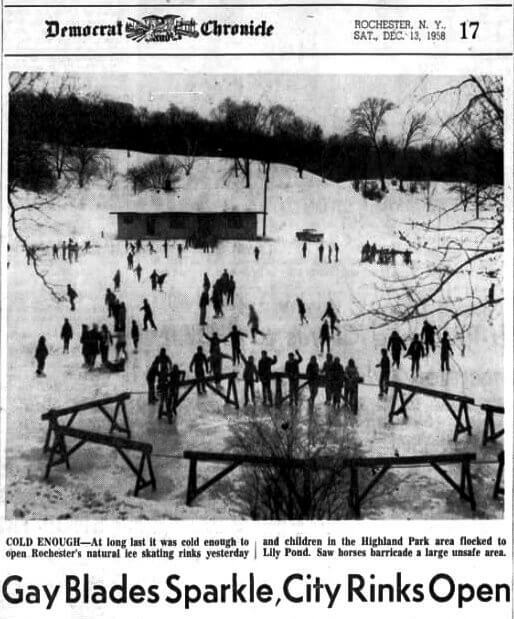 From Engaging families in the Highland Bowl According to the Democrat and Chronicle, the original plan in the 1950’s was to drain Lily Pond and turn it into baseball diamonds. Community protests kept the pond intact. Brandon Young in the distance. 1/29/18. The warming hut has not changed in 60 years.